WASHINGTON (Reuters) - The White House's top lawyer has cooperated extensively with the special counsel investigating Russian interference in the 2016 U.S. election, sharing detailed accounts about the episodes at the heart of the inquiry into whether President Donald Trump obstructed justice, the New York Times reported on Saturday. On Saturday evening, McGahn's lawyer confirmed the White House counsel had cooperated with Mueller's team. 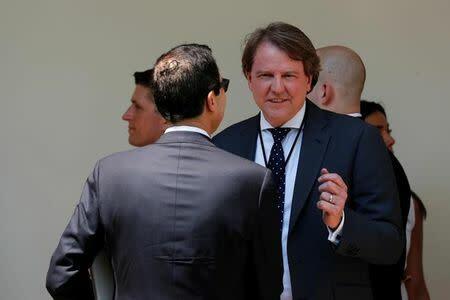 "Mr. McGahn answered the Special Counsel team's questions fulsomely and honestly,” William Burck said, explaining the president did not ask McGahn to refrain from discussing any matters. According to the New York Times, McGahn in at least three voluntary interviews with investigators that totalled 30 hours over the past nine months, described Trump's furor toward the Russia investigation and the ways in which the president urged McGahn to respond to it. The newspaper reported McGahn's motivation to speak with the special counsel as an unusual move that was in response to a decision by Trump's first team of lawyers to cooperate fully. But it said another motivation was McGahn's fear he could be placed in legal jeopardy because of decisions made in the White House that could be construed as obstruction of justice. McGahn, the newspaper said, shared information on Trump's comments and actions during the firing of the F.B.I. director, James Comey, and the president's obsession with putting a loyalist in charge of the inquiry, including his repeated urging of Attorney General Jeff Sessions to claim oversight of it. The newspaper said McGahn was also centrally involved in Trump's attempts to fire the special counsel, Robert Mueller, which investigators might not have discovered without him. 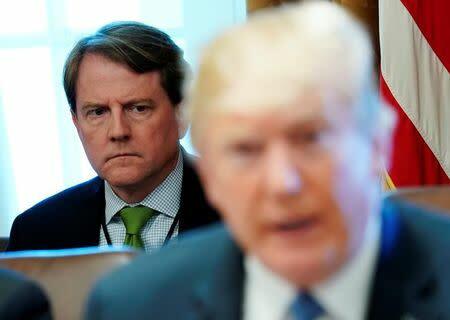 A source close to the president told Reuters on Saturday the extent of McGahn's cooperation was "a tactical or strategic mistake" instigated by Trump's first legal team and it should not have been allowed to happen because McGahn should have been covered by executive privilege. The person also said Trump is not worried because he does not feel he did anything wrong. "Lot to cover," Dowd said in text message. "Did a great job. McGahn was a strong witness for the President according to Burck and debriefs of DM (Donald McGahn). Not aware of any of the alleged apprehensions manufactured by the NYT." "I allowed White House Counsel Don McGahn, and all other requested members of the White House Staff, to fully cooperate with the Special Councel," Trump wrote. Trump has repeatedly denounced the investigation into whether his campaign colluded with Moscow as a "witch hunt." Rudy Giuliani, who joined the president's outside legal team after Dowd resigned, told Reuters on Saturday that Trump's lawyers had been in contact with McGahn's counsel after he was interviewed and possessed "emails that say he provided nothing that was damaging or incriminating to the president." Giuliani said McGahn's cooperation with Mueller was part of a legal strategy. As an officer of the court, he added, McGahn would have had to resign if he thought the president did anything illegal. Giuliani said he did not believe McGahn was cooperating against the president, noting Trump's lawyers and McGahn's have a joint defence agreement that would have otherwise ended.